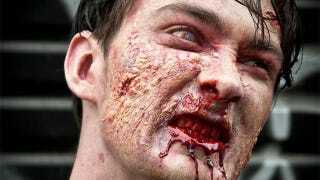 You Can Play a Zombie Shooter in Real Life. It Looks Insane. An Australian group called IRL Shooter will at the end of the month be holding an event called "Patient Zero", which is basically aimed at giving you the experience of playing a zombie shooter, only in real life. Starting October 31 in Melbourne, for AUD$125 you'll get access to the "game", which sounds a lot like the blood-soaked offspring of theatre and a shooting gallery. From the outset the whole thing is neck-deep in role-playing, with customers given a military-style briefing before being let loose in an installation crawling with zombies—ie. actors in full make-up—who are out to eat your face off. There are video game-like objectives to complete, like rescuing civilians and retrieving data, while players will be encouraged—but not forced—to act like a team. Originally planning to use Airsoft guns for a truly authentic experience, the organisers have had to switch to laser tech, the weapons looking like fairly badass replicas of M4 carbines. A single "game" lasts around ninety minutes. While it's got the potential to be campy as hell, with the right people it could also be the best thing ever.